A team of preLights selectors respond to a meta-analysis of bioRxiv preprints. *all authors contributed equally; cross-posted from here. The growing adoption of preprints over the last five years in the biological sciences has driven discussion within the academic community about the merits, goals, and potential downsides of disseminating work prior to peer review. However, the community has lacked a systematic bibliometric analysis (Figure 1) of preprints in which to root these discussions. 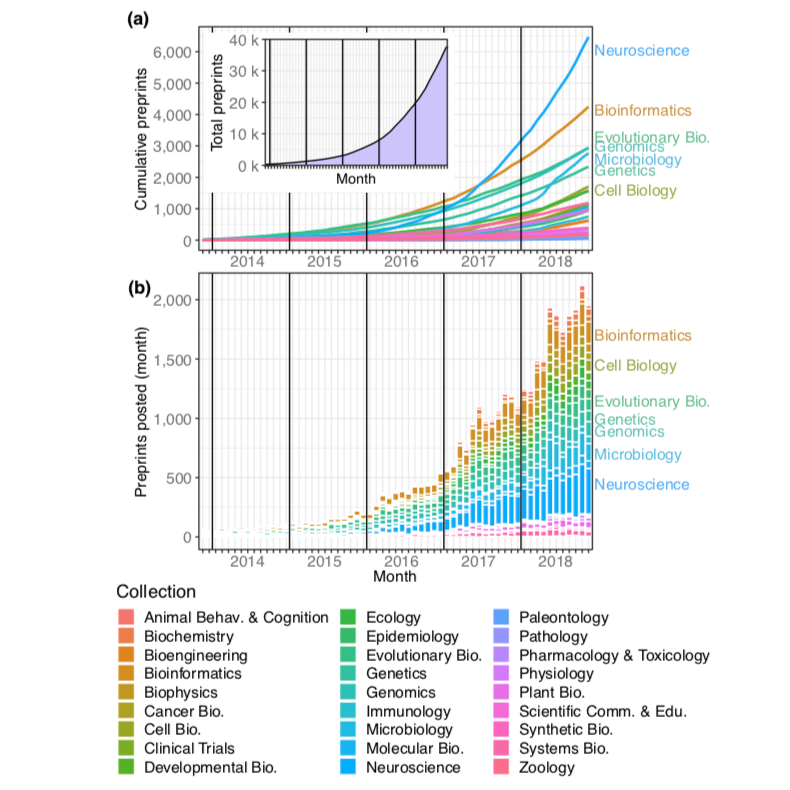 Abdill and Blekhman1 have generated an analysis of the data to identify trends in preprint usage, popularity, and outcomes, and created the website rxivist.org to facilitate future analysis and to provide an alternative platform for discovering actively discussed preprints. As with all bibliometric methods, it is important to keep in mind the potential for manipulation or misuse – as summarised in Goodhart’s Law, when a measure becomes a target, it ceases to be a good measure2. While we applaud the introduction of quantitative measures for preprint “success” in the rxivist project and the enablement of detailed analyses conducted by the authors, we are mindful that a small number of metrics should not be used to define a preprint without critical engagement and evaluation. The use of Twitter activity as a metric for popularity of preprints on the rxivist website helps flag some issues of interest. First, biases in research communication using social media are poorly understood. For example, among scientists active on Twitter, there is widespread variation in the number of their Twitter followers3. As such, the interests of a single popular scientific influencer could potentially drive far greater disparities than are reflected in quality. The eventual publication outcomes of preprints – their appearance in some peer-reviewed journal – feature heavily in the metrics utilised by Abdill and Blekhman. The authors found that two-thirds of bioRxiv preprints posted between 2013 and the end of 2016 were eventually published in peer-reviewed form. This high rate indicates that authors tend to post quality preprints, therefore initial fears that work not meeting certain scientific standards might ‘clog’ bioRxiv appear to be unfounded. 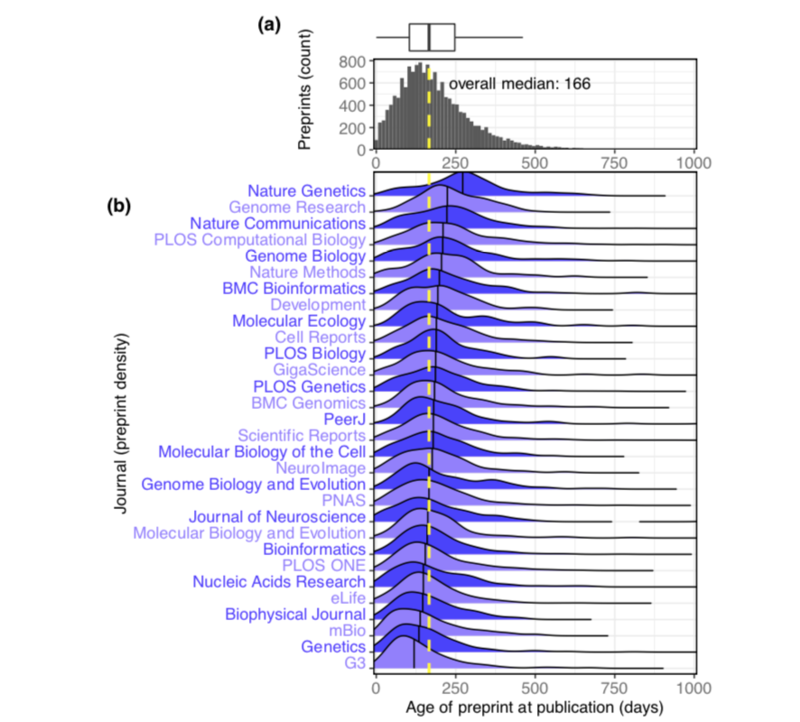 The median time from the posting of a preprint on bioRxiv to its final publication in a peer-reviewed journal was just under six months, although this varied substantially, depending on the eventual journal of publication (Figure 2). In terms of accelerating science, pushing forward the public dissemination of new information by an average of six months could be considered a significant success- especially for early-career researchers, for whom six months represents a large fraction of their total career progress. Having their work and ideas publicly available enables them to receive feedback earlier and prepare effectively for career transitions. On the other end of the scale, what about preprints that are never published in peer-reviewed form? Missing links to final publications in the rxivist website and analysis may be partly a technical issue – changes in authors or preprint title make it difficult for automated formats to match preprints to their final publications – but this is unlikely to account for many preprints. Instead, of greater concern is whether these unpublished preprints are of lower quality and are constructed on the back of poor science that would not pass the stringency of peer review. We argue that a lack of final publication should not be held as an indictment of the quality of a preprint. First, preprints help to communicate results more rapidly, particularly in instances where matching a manuscript to typical journal expectations may be difficult or impossible – for example, following the departure of the primary author from a lab. Second, preprints can serve as useful repositories of negative results, which often remain unpublished – after all, “a negative result is still a result”. Therefore, preprints communicating preliminary or shorter stories can prompt discussion and study in the field and be as successful as those that lead to full publication, especially if they invalidate previous hypotheses or drive changes in research that lead in different directions.